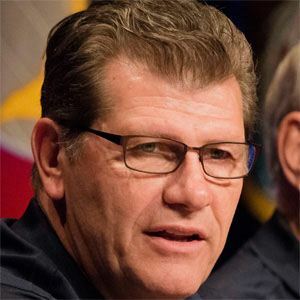 Hall of Fame women's basketball coach who debuted for the University of Connecticut in 1985 and set a record by becoming the fastest NCAA coach to reach 800 wins. He's won a total of 11 NCAA titles with Connecticut. In 1977, he graduated from West Chester University of Pennsylvania. He won his first NCAA title in 1995 after an undefeated season. He was born in Italy but emigrated to Norristown, Pennsylvania, when he was 7 years old. He coached star guard Diana Taurasi in college.